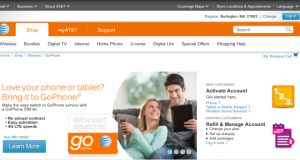 Today I wanted to tell you about AT&T GoPhone Prepaid Wireless’ new $45 and $65 plan. On March 10 2017, AT&T started offering two new plans plans that really change up prepaid wireless. 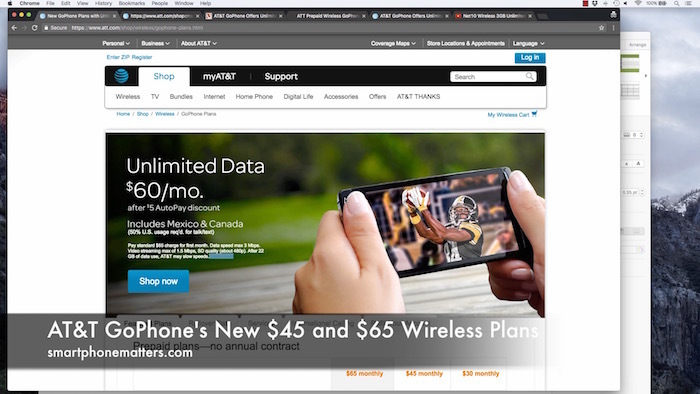 Now I found out about these plans after I published my article about Net10 Wireless’ $40 3GB unlimited plan. In fact, I checked GoPhone’s rates before I published and at that time the $45 plan only included 4GB of high speed data. So I missed their announcement by less than a day. The first plan is their new $45 plan. This plan includes unlimited talk, text, and data with 6GB of high speed data. After you use up your high speed data, you’ll still be connected to the network but an a reduced speed of 128Kbps. If you sign up for automatic payment with GoPhone’s Auto Pay feature, you’ll save $5 per month and only pay $40. This plan also includes calling to US, Canada, and Mexico as well as roaming service. The plan includes roll over data so you’ll be able to carry your unused high speed data to the next month. This new $45 plan is a good deal. For me with sales tax, it would cost only $32 more per year than the Net10 plan I wrote about. Now if you use 3GB of data or less per month, the Net10 plan is less expensive. But the GoPhone plan has other features. It has the calling and roaming between the US, Canada, and Mexico. It also has roll over data. If you use the iPhone, your MMS picture messages and group texts will work. Those messaging features also work with Net10, Straight Talk, and tracfone but not some other prepaid wireless services that use the AT&T network. And if your an iPhone user, you’ll also have Visual Voicemail. At least Visual Voice Mail worked for me when I reviewed GoPhone back in March 2015. The second plan is an unlimited $65 plan. This plan includes unlimited talk, text, and data. It seems that the data has a max download speed of 3 Mbps. AT&T also sets a max download speed for video at 1.5Mbps and says your video will play at 480P quality, which is about the same a DVD disc. AT&T also adds that after you use 22 GB they may reduce your speed temporarily at times when their network is congested. The don’t state how much they will slow your connection and the way the description reads is that they will slow you down only when there network is congested. The unlimited plan is well, interesting. It promises unlimited data, or at least 22GB per month before it reduces speeds. The however have set a 3Mbps max download speed for data and a 1.5Mbps download speed for video. These speeds are no where near the speeds AT&T’s 4G LTE network is capable of. I’ve measured speeds 30 times higher with other prepaid wireless plans that use the AT&T network. Cricket Wireless sets their max download speed at 8 Mbps. Cricket is owned by AT&T and used the AT&T network. And if you use just about any other prepaid wireless plan that uses the Verizon network, your max download speed is 5Mbps. The only exception is Verizon’s own prepaid service which does not set that limitation. So is 3Mbps fast enough? I don’t know. For some people, maybe. For now, I’m going to leave that as a open question for a future article.